Review: A beautiful young woman, Belle, takes her father’s place as the prisoner of a mysterious beast after he is caught stealing a rose from the Beast’s garden. He wishes to marry her and proposes marriage on a nightly basis. This is the most magical of all the Beauty and the Beast films. Jean Cocteau uses really simple visual effects which stand out. For instance the uses of candles have an electrifying effect. This amazing scene was achieved by blowing the candles out and then running the film in reverse as he walked backward past them. The entire sequence was done in one long take and reversed. It took five hours to apply the make-up on Jean Marais which left his skin very raw after. For the designing/costuming the director took inspiration from the painter Vermeer. In fact it was the look of the farmhouse scenes that was inspired by the paintings of Jan Vermeer. There was also inspiration taken from the painter Dore as well as Vermeer. 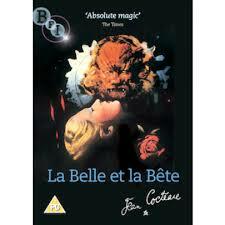 Apparently Jean Cocteau during production suffered a skin disease and was rushed to hospital. The director Peter Jackson once said about this film “The most perfect cinematic fable ever told”.